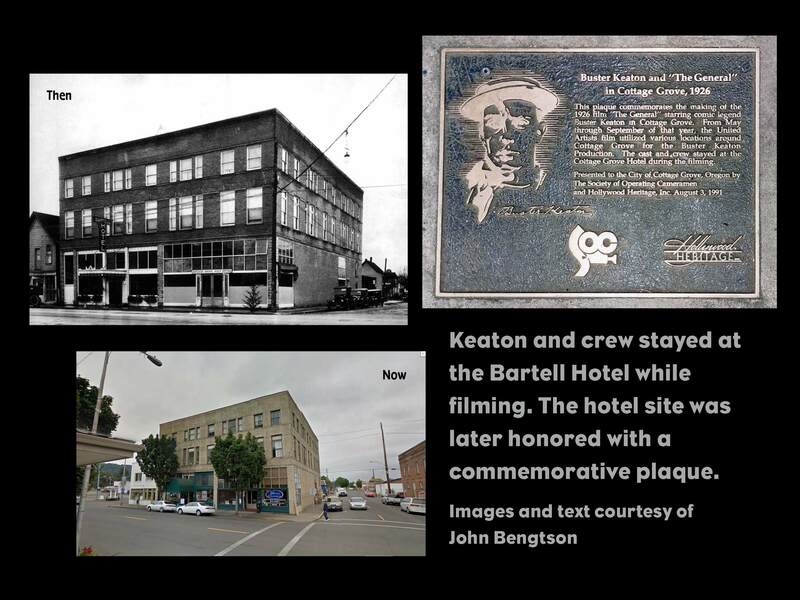 As shown in this previous post describing how Buster Keaton filmed The General in Cottage Grove, Oregon, Buster and crew stayed at the Bartell Hotel during the production, staged the summer of 1926. The hotel stands just a block or two west from where most the filming took place. But the hotel, later re-named the Cottage Grove Hotel, has another claim to classic comedy fame. 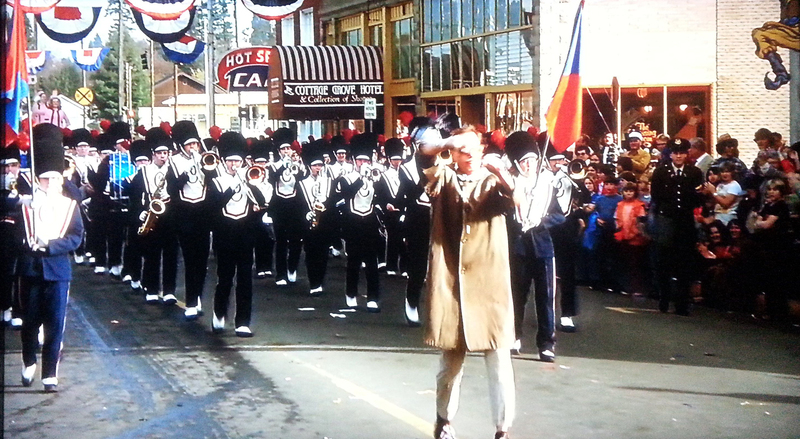 The hotel appears during the homecoming parade finale to the 1978 comedy Animal House. 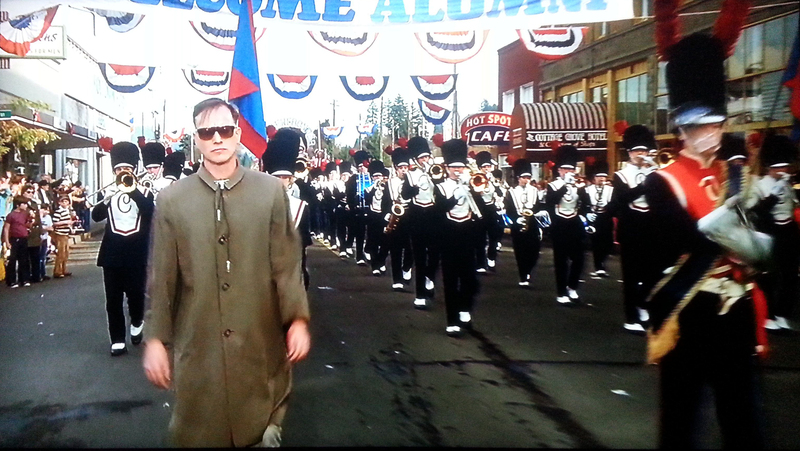 When “Stork” (played by the film’s co-screenwriter Douglas Kenney) diverts the marching band into a dead-end alley before the Delta House wrecks havoc on the parade, you can clearly see the Cottage Grove Hotel awning in the background. Click to enlarge – looking east down Main Street towards the Cottage Grove Hotel. Click to enlarge – Stork begins to divert the band. Both The General and Animal House have been inducted into the National Film Registry of the Library of Congress as works of enduring importance to American culture; Buster in 1989, and The National Lampoon comedy in 2001. This brief video hosted by A.M.P.A.S. from a talk I gave in 2011 further explains how Buster filmed The General in Cottage Grove. You can read all about filming The General in my Keaton film locations book Silent Echoes. This entry was posted in Buster Keaton, The General and tagged Animal House, Buster Keaton, Cottage Grove, Silent Comedians, Silent Comedies, Silent Movie Locations, Silent Movies, The General, then and now. Bookmark the permalink. 6 Responses to Buster Keaton, The General, and Animal House? GREAT stuff and great catch, John! Let the National Film Registry know that fact (that the Hotel appears in both films!). Also, let the Oregon Film Commission know this interesting Historical fact! As someone who just discovered this website I’ve got to say thanks for meticulously researching the filming of Keaton’s masterpiece. Being from the UK I’ve been unable to visit Oregon myself, but looking on Google Earth I’ve been able to use your work to match up most of the filming locations. I did however have a question. Where exactly in Culp Creek was the Rock River Bridge constructed? Searching the internet I’ve seen a number of conflicting accounts, but the general consensus suggests it was downstream of the current town, adjacent to the former Culp Creek Mill. Is this correct? I also have another question (well, not so much a question as a search for clarification). Approximately 31 minutes into the film (the climax of the northbound chase) the General, under the control of Captain Anderson, passes under a substantial trestle bridge, before looping around to come to a halt atop said trestle. They then use this elevated position to pelt Buster’s persuing Texas with firewood as he passes beneath them. My question is, where was this filmed? I can’t find any maps of the Oregon & Pacific Railroad showing such a spiral loop, and it seems like a very subtantial structure (far bigger than the already expensive Rock River Bridge) to have been built solely for filming. There is however a very convincing story on Trestlewalker.com and Bridgehunter.com that it was on a logging railroad operated by the Willamette Valley Lumber company near Black Rock, Oregon. Williamette lumber was owned by a fellow named George Gerlinger, and it was Gerlinger’s workshops at nearby Dallas, Polk County, to which Keaton (allegedly) sent the locomotives to be modified for filming. This all serves as great anecdotal evidence, but is there any way of confirming it? Cheers, and thanks for your time! Hello, Rhys Davies! It had long been a question among silent film fans and railroad fans as to where the over-and-under trestles scene had been filmed. Several Oregon rail historians have been trying to figure it out for decades. Personally, the first thing I did was to research the logging railroads outside of Cottage Grove, but not a one of them had an over-under trestle. You may well image how rare such a thing was. I finally located photographs of three out of four known over-and-under trestles, and using Photoshop, superimposed still images from The General over these images. None of them matched, though the over-and-under trestle at Fourth Of July Creek, near Valsetz, Oregon, was the same height and had the same spacing of supports, if you ignored the fact that the hills in the background didn’t quite match, there was no cross-bracing on the trestle, and the trestle curved in the wrong direction. We finally got a break in 2014, when a friend found an obscure local publication that had a picture of the original trestle at the west end of Black Rock, Oregon. This hitherto unknown photograph was the right height, the number of uprights and cross bracing matched, there was an over-under track arrangement and both the trees and hills in the background were a match. I did a photo overlay and the scene from the movie and the trestle photo were also a match. We immediately gathered a group of rail historians and rail fans and repaired our way to Black Rock – in 15˚ F weather – to visit the trestle site. We picked January to go because once the trees and brush leaf out in the spring, you can’t see a thing through the foliage. Although the trestle is long gone, we were able to match the hillsides with the scene from the movie in person, as it were. As for confirming with documentation, there is nothing yet to be found, but since the Gerlinger locomotive works in Dallas, Oregon repaired and backdated the locomotives used in the movie, and the Gerlingers were part owners of both the logging railroad at Black Rock and the Salem, Falls City and Western, which led to Black Rock, I am fairly certain that this is the site of the over-under trestle scene. The locomotives were in the right place, at the right time, and this is the only over-under trestle in near vicinity to anyplace the locomotives had been. You do have to be fairly careful at to documented sources regarding this movie. I have seen, in print, by “historians” who ought to have known better, that “The General” was filmed on the actual railroad in Georgia (it wasn’t), that it was filmed on a narrow gauge railroad in Oregon (it was a standard gauge railroad in Oregon), that the Original Texas and General were used (they weren’t) and that it was all filmed on the studio back lot (it wasn’t) or any combination of the previous statements. Sadly, there are no living witnesses who can confirm that the Black Rock Trestle was where the scene was shot. George Gerlinger, who was the last of the Gerlingers who were alive back when the movie was filmed, passed away about 20-30 years ago. Strange world…was just watching Buster in that old Twilight Zone time travel episode last night while taking a break from researching railroad artifacts. I was born in Hollywood just before that in the era of Stand By Me (another great one filmed around here). I walked through that hotel around ’93, not knowing the Hollywood connection, and got a real creepy feeling in there. Used to go junking in Cottage Grove back then (before it was heavily altered) and found some rare china from Hotel Alexandria (heavily connected to early Hollywood). Across the street from the CG hotel, under the awnings in your photos, was a short lived antiques store. Hanging on the back of a door was a late Union Pacific Sun Valley ski poster (a real one) which is another obvious Hollywood connection. Of course I snagged it! This could go on and on…Animal House, American Graffiti, but still looking for that Emperor Of The North Pole find (actually, I have one indirectly related through Junction City). Guessing when you grow up in Hollywood it’s never far away. Thanks for sharing this Al. The movies have been an integral part of our lives for over 100 years, so there are countless moments where real life and the movies intersect.